COROCORD Frame Nets - a brand new product line of innovative rope play. The product line draws on the newest technology to facilitate various ways of customisation with the use of membranes, themes and colours. 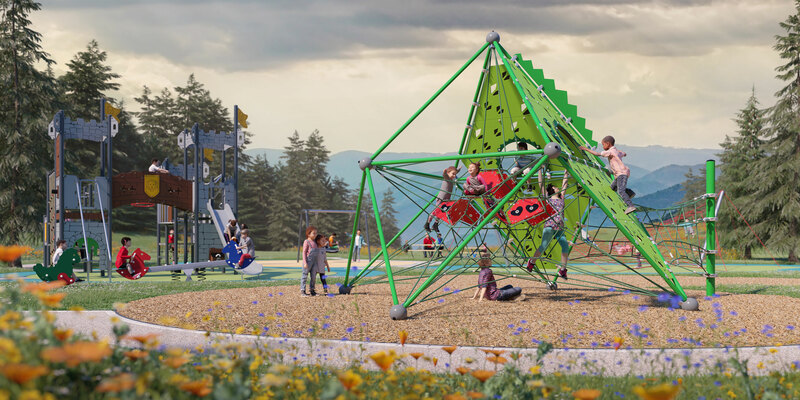 The series offers 5 different designs, that all unfolds from a core structure to an advanced premium play solution with membranes, add-ons and themes. 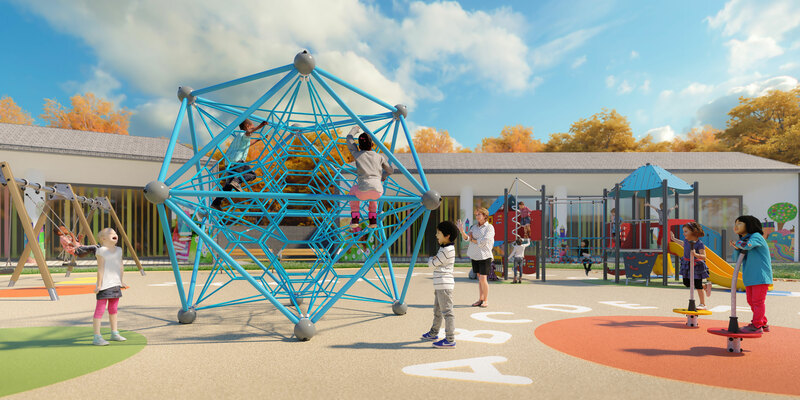 The Frame Nets unfold a three-dimensional rope environment in which children can move freely and play in all directions. Navigating around in the Frame Nets' web of ropes encourages logical thinking in the child, and stepping from one rope to the next trains the child's cross-coordination skills and body strength. Picture on the right: Dragite dragonite with thematisation and add-on. Green colour chosen. Pictures below: Circite Flowite and Medite with add-on. The many groundlevel activities and entry points welcome many different age groups and abilities. 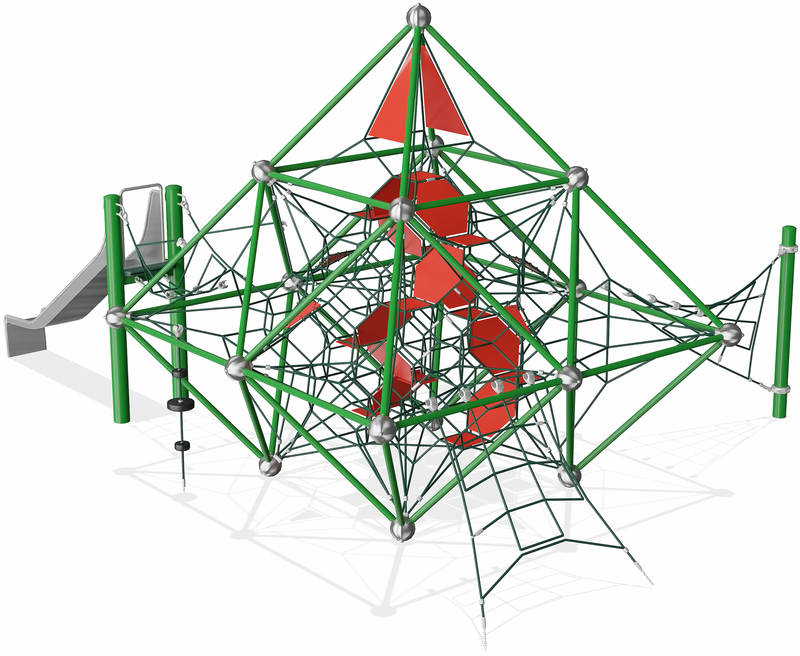 Younger children can have room for quieter play below and interact with older children climbing above. Children with disabilities are also part of the play as they can get up close to the structure in their wheelchairs and play with the groundlevel activities. The Circite Flowite, here above, offers manipulative elements, hammocks, super triangle and sound-flowers. The transparent design gives the children playing on the ground a sense of being included in the play going on throughout the structure. They can see and interact with friends playing above at all times. Unfolding the design and play value of the Dragite structure. A similar structure applies to all other core structures. 1. Dragite core structure. The dragon is still sleeping. Do you dare bring it to life? 2. Dragite with house membrane. The dragon is slowly awakening. The membranes inside the dragon's heart increase the fun inside. The membranes come as small nests stimulating social play. 3. Dragite with path membrane. The paths stimulate physical play. 4. Dragite with add-on. Add a tail to the dragon and make extra room for fun on the outside. 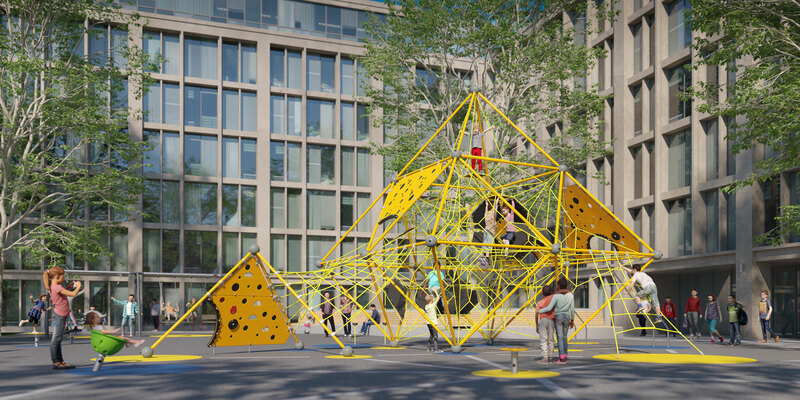 The add-on increases the capacity of the structure by allowing more children to play simultaneoursly. 5. Dragite dragonite with thematisation. The dragon is awake and stretching his wings. Fit it to your needs and choose the colour of your dragon. The Frame Nets are available in five fully transparent core structures ranging from 3 to 6.4 meters in height. Add membranes, add-ons and themes to increase the fun and play capacity and choose your colour. 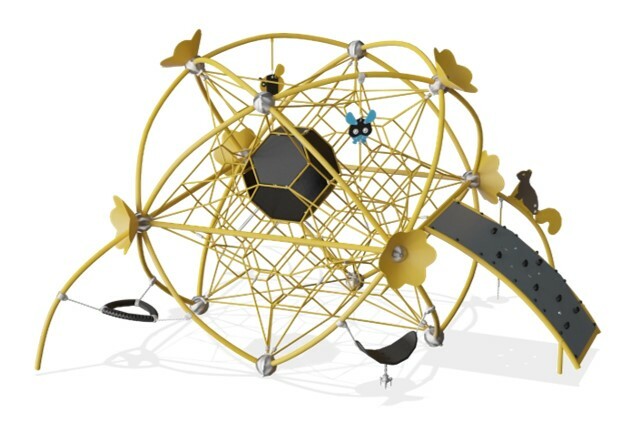 Whether it's in a schoolyard, a public park or a preschool - the COROCORD Frame Nets are a magnet for play. The unusual look triggers children to come and explore and use their body and imagination as they play. 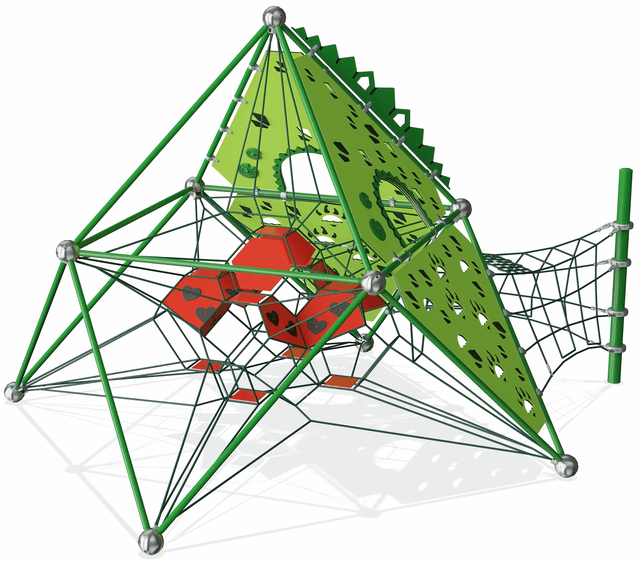 The openended, rope-filled design sparks childrens' creativity on how to navigate through, over, under or around it. The Frame Net structures are easy to include in any setting, even when very little space is available. A Frame Net structure leaves a very small footprint and takes the play up high and inside its three-dimensional rope universe. 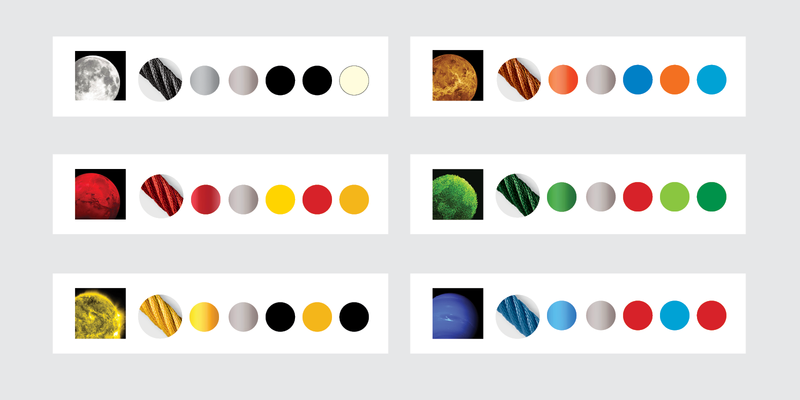 The COROCORD Frame Nets are available in 6 galactic colour themes. The themes draw on bright colours that appeals to children of all ages. Other colour options are available on request.